From professional development opportunities to classroom activities to awards and grants, CSTA has combed the Web and gathered a large number of references to help you find those resources that best meet your needs. We encourage you to explore the resources listed on the left, and please be sure to visit the science education suppliers' page to see the great products and services offered by some of the top education suppliers in the country. A color poster is available for download. 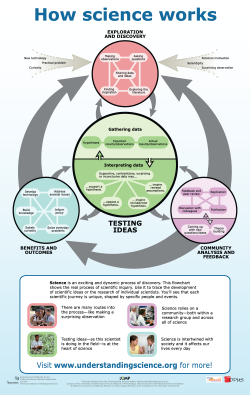 This poster depicts how science really works. From the UC Museum of Paleontology. If you have a resource you would like added to the CSTA website, please click here. CSTA makes no representations whatsoever about any products or services posted on other websites which you may access through this one. When you access a non-CSTA website, please understand that it is independent from CSTA, and that CSTA has no control over the availability or quality of products of services listed on, or content of, that website. In addition, a link to a non-CSTA website does not mean that CSTA endorses or accepts any responsibility for the content, or the use, of such website. It is up to you to take precautions to ensure that whatever you select for your use is free of such items as viruses, worms, trojan horses, and other items of a destructive nature. The CSTA website you are viewing contains a Suppliers Guide presenting information about programs, products, and services offered by third parties, as well as a listing of science websites recommended by visitors to the CSTA website. The presence of a listing or such information does not constitute an endorsement by CSTA of a particular company or organization, or its programs, products, or services. IN NO EVENT WILL CSTA BE LIABLE TO ANY PARTY OR ANY DIRECT, INDIRECT, SPECIAL OR OTHER CONSEQUENTIAL DAMAGES FOR ANY USE OF THIS WEBSITE, OR ON ANY OTHER HYPERLINKED WEBSITE, INCLUDING, WITHOUT LIMITATION, ANY LOST PROFITS, BUSINESS INTERRUPTION, LOSS OF PROGRAMS OR OTHER DATA ON YOUR INFORMATION HANDLING SYSTEM OR OTHERWISE, EVEN IF WE ARE EXPRESSLY ADVISED OF THE POSSIBILITY OF SUCH DAMAGES.